HUANG Pang-chuan, born in 1988, had been working as a graphic designer, photographer, and film editor for several years, before he enrolled in the course “Cinema and Audiovisual studies” at Sorbonne Nouvelle – Université Paris 3 (France). After graduation, he was accepted as artiste étudiant into Le Fresnoy - Studio des arts contemporains. 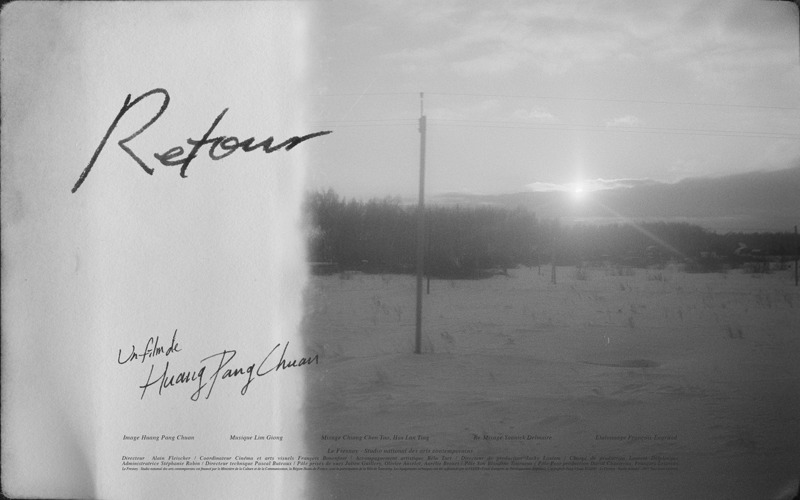 Return is HUANG’s first film, which he completed after his first year of studies at Fresnoy . It had been screened at several festivals in France and Taiwan, and gained the 2018 Clermont-Ferrand - Lab competition Grand Prix Award and the Special Jury Mention of the TIDF 2018 Taiwan Competition. On this long trip through Europe and Asia, HUANG’s luggage had to undergo numerous inspections, which left some of the negatives damaged by X-rays. HUANG says: “Probably nobody would notice, but those damaged pictures appear in the section of the film where the massacre is mentioned. I think that fits quite well.” He is fascinated by photographic negatives for their uniqueness, their irreversibility, and the special feeling that they evoke. On top of having all those written documents and pictures, he also put a lot of additional effort into collecting oral materials from his family members. Still, those memories would remain odd and fragmentary. HUANG would go over them again and again, weighing every word, and putting the pieces together. In his opinion, historical documents have to be respected, but at the same time, he wants to give room to his own imagination of the past. Due to the distance in time, reality becomes blurred and therefore impossible to be accurately described. In HUANG’s view, one has to embrace the present moment to look at a story from the past, and use one’s creativity to give new life and meaning to it. Not only personal memories, but also the meaning of history can be revived through creativity. Although Return is based on a family’s history, concrete historical references and place names were eliminated in the voice over. Thus, the film is not so much a tale about a person’s life in wartime China and Taiwan, it is more like a mirror reflecting the human condition in general. Difficulties of language barriers, the impact of war, the displacement of people being forced into homelessness and migration, all those problems that are not limited to the boundaries of individual countries, are alluded to in his film. When screened at the 2017 Poitiers Film Festival, HUANG’s film was praised in the discussions to decide the Human Rights Award because of its humanistic sentiment, as HUANG gratefully remembers. HUANG prefers situations that cannot be controlled, for example encountering the uncertainties of travelling. “What influenced me most in TARKOVSKY’s films is this elementary force that cannot be controlled.” Unforeseeable first-times never fail to have an impact on HUANG. The realization of his plan to venture out for this long trip, might have finally been even more important than the narrative in the film. When we are creating something, our imagination can achieve a lot of things. If we entirely rely on the narration, we would waste our ability to imagine. Another impressive narrative element in his film is the use of sound. HUANG uses realistic sounds that he recorded during the journey, from inspiring surrounding sound sources to interesting dialogues from passers-by. The soundscape’s repeatedly occurring details create a vast imaginative space. “If it comes to editing, I think that rhythm and sound are even more important than images. Actually, the sound tracks were often randomly piled together. I would just close my eyes and listen, until it sounded pleasant to me. I wouldn’t be able to repeat this process. The only exception is at the end of the film, when the sounds from my repertoire seemed inappropriate. So, I asked LIM Giong, the sound designer of my film, to add an extra sound. “I was abroad when I was looking for a sound designer for my film. I contacted LIM Giong by email, at a time when my film only existed as a proposal.” LIM Giong added his music at the very end, when the editing with all the images and sound effects was finished. After that, there were no more changes. When his film was screened at festivals in France, HUANG observed how the audience reacted to the soundscape: “As soon as the typical sounds of the French railway stations could be heard, the whole theatre was laughing. It was so familiar to everybody. Because he pays so much attention to sound, he decided to read the French voice-over himself. “I speak French with an accent. The Taiwanese audience wouldn’t probably pick it up, but the French would immediately know that a foreigner is speaking. Likewise, when a dialogue in Chinese occurs, it sounds very familiar to a Chinese speaking audience. This reminds us that language can create a warm, nostalgic feeling, but it can also lead to ethnic division. HUANG uses language for both purposes: To make us realize what it means to be a stranger, and to convey the feeling of belonging to one’s own country. Asked about directors that he likes, HUANG mentions HOU Hsiao-hsien. “I particularly like the last scenes of his films, and his way of using music. He never wraps up a story at the end, but lets you take the film back home so that it continues to resonate within you”. The last scene of Return has this kind of magic. It is the only part of the film where HUANG used a Super 8 camera instead of a still camera. It is a touching scene, which does not seem to be the end of the film, however. Rather it seems to be a gentle question, asking us where we come from, and where we are going.